From the Everquest 2 player manual: Those who seek up-close combat will find the melee-driven style of the Guardian to be to their liking. The Guardian is the front-line force in a party. Combining the power of armored protection and physical prowess, the Guardian can take large amounts of physical damage from enemies and remain standing. This style of combat requires the Guardian to be in close range with his target at all times. 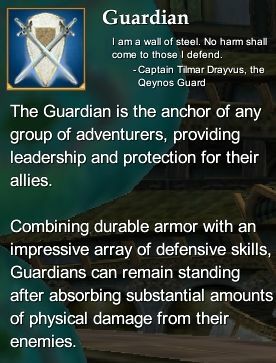 The Guardian's role allows the less resilient members of his party to perform their roles more effectively. This page last modified 2011-08-25 22:55:24.